Providing a modern take on stacked looks, this sterling silver Double Hearts of PANDORA statement ring doubles up the classic eternity design. 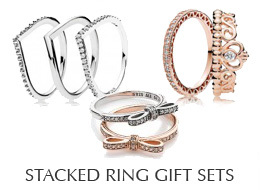 Dotted with cubic zirconia, it adds the perfect hint of shimmer to your finger. Ships Monday, April 22 if ordered in the next 2 days, 22 hours and 4 minutes! PANDORA Double Hearts of PANDORA Ring in sterling silver with 92 bead-set clear cubic zirconia and cut-out hearts.